I’ve always silently judged friends who go bananas on their wedding expenses. Then, I got engaged. It took me about two days to realize I was in over my head. My husband’s dad is a pastor, and his family wanted to invite the entire church. His side of the family is also huge. Including the congregation, our families and our wedding party, we already had over 175 people on the guest list. And there were other friends we wanted to invite, as well. I realized this was not going to be a small, affordable event. 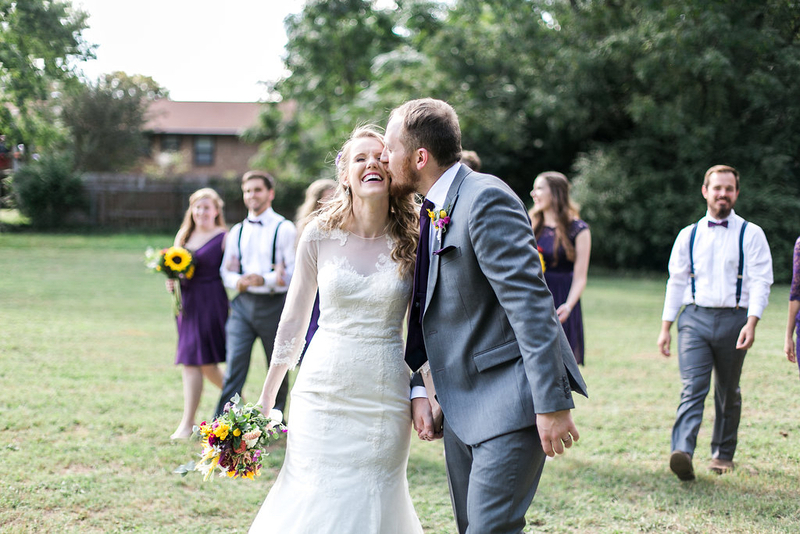 My wedding ended up costing around $8,000 — way more than I ever planned on dishing out. I cringe in embarrassment as I type that number. But it had the potential to be so much more expensive. I had to get creative about ways to save money. My primary means of doing so was to shop at places I never would have considered if I hadn’t been so desperate. Here are five things I bought from weird places, plus an invaluable strategy for saving money. Altogether, these tactics saved me thousands. I was recently a bridesmaid in a wedding with the most gorgeous flower arrangements I’d ever seen. Flowers were clearly at the top of this couple’s priority list. The bride told me she’d spent $4,100 on flowers, plus $650 for bouquet deliveries. According to The Knot, the average couple spends $2,141 on flowers. Even that number was daunting to me. I quickly decided that if flowers weren’t at the top of my priority list, I couldn’t afford to spend much on them. And that was fine. We chose to splurge on the photographer instead. I decided I wanted sunflowers. They are the happiest flowers in the world. They don’t need professional florists to make them look beautiful! I called Costco and ordered 11 premium bouquets. The price of one bouquet was $14.99, so 11 cost me $165. We used these arrangements to make smaller bridesmaid bouquets and supplement our other decorations. Keep in mind, Costco’s flower department is not an official florist. That means it cannot guarantee ahead of time that it will have certain flowers in stock, so it doesn’t accept orders for specific flowers in premium bouquets. You can only request certain colors. I requested yellow as my primary color and purple as my secondary color. Upon picking up the bouquets, my mother-in-law noticed that most of the yellow flowers were not sunflowers. Since sunflowers were in season, she switched them out, and there was no issue. Don’t be afraid to tell the employees what you want when you pick up your flowers. My mother-in-law also spent $150 from her own budget on my bouquet, the groom’s boutonniere and an extra bucket of sunflowers to support her friend’s burgeoning flower business. Altogether, my husband and I spent a meager $315 on flowers. And you know what? The flowers were stunning. Thanks, Costco! Tiny items, such as vases and candles, don’t seem like huge indulgences. They are typically pretty affordable at Target or Walmart. Those expenses add up, though. I quickly learned from my mother-in-law, who is a thrift store fiend, that Goodwill is the place to go. Various family members stopped by Goodwill at least three times per week during our eight-month engagement. We bought mason jars, vases, a flower girl basket, picture frames, candlesticks, linens and chalkboard signs for just a couple bucks a pop. We only ended up spending around $120 for all these items. Wedding shopping never felt so guilt-free. We spent a lot of time shopping online and at thrift stores for a wedding arch. However, everything in our price range was flimsy and unimpressive. Thankfully, while driving past a yard sale, my father-in-law noticed an arch. It was much larger and sturdier than anything we had found that was within our budget. When I searched online for an arch of similar style and quality, the cheapest I could find was one on Amazon priced at $132.83. This one was only $45. We decorated that arch with flowers and a few huge fake sunflowers from Hobby Lobby. That $45 yard sale find made our ceremony photos amazing. After my father-in-law sold the archway, we broke even. Not a bad deal at all! When a close friend got married, the only beverages she chose to serve were water and sweet tea. Her venue’s caterer charged $20 per gallon of tea. “Once I saw how much tea cost, I didn’t even want to ask about the price of alcohol!” she said. I, on the other hand, love parties way too much to even consider cutting that cost. I wasn’t one of those little girls who dreamed about her future wedding growing up. But once I started attending the weddings of numerous close friends, one of the only things I could picture about my own big day was that there would be a bar. I settled for only serving wine and beer. Buying one keg wasn’t too pricy, but I worried that purchasing a bunch of wine would set me back financially. Here’s the secret: boxed wine. Now, you may not want people to think you’re tacky for serving boxed wine at your wedding. I bought a couple of cute drink dispensers from Marshalls for $20 each and emptied the wine into those for the bartender to use to fill glasses. Guests never even saw the boxes. After a painful amount of shopping around, my fiance and I discovered the cheapest boxed red wine was at Walmart. We bought 5-liter boxes for only $16 each. Be careful, though. We used this guide to decide how much wine to buy, but we still overestimated how many of our guests would actually drink. As a result, we had several boxes of wine left over. We didn’t find out until after our wedding that in Georgia, where we lived, stores can’t accept returned alcohol, even if it’s unopened. We could have reduced our expenses by an additional $100. I even relied on my husband to save money. He was one of the few grooms I’ve known who was really involved in wedding planning! He plays around with blacksmithing in his free time, so he made both our wedding bands out of copper pipe he bought at the Home Depot for $10. He also added some brass pipe he already had in his garage to make his ring. He silver-plated my copper band so it would match my engagement ring. He followed this simple guide. Not bad, considering The Knot estimates one wedding band can cost anywhere from $330 to $1,100! Added bonus: When we both ended up losing our bands less than a month into our marriage, we were much less devastated than we would have been had we spent a fortune on our rings. Now, we don’t even wear wedding bands. Asking friends and family to help with your wedding can be a sticky situation. You don’t want to take advantage of anyone or make them uncomfortable. But guess what? Most of my friends were so psyched that I’d found someone crazy enough to marry me that they were more than happy to help. One bridesmaid is a freelance graphic designer and created our invitations and programs for free. She would have normally charged a customer $125 for that package. A family friend, who volunteers as a day-of wedding coordinator, offered us her services. The Wedding Planner Book recommends day-of wedding planners in the South charge between $600 and $900. Hiring someone for one day would have increased my wedding expenses by around 10%. No thanks! My husband’s friend is a baker. She made us an amazing three-tier wedding cake. Each layer was a different flavor. (I still have dreams about this cake.) She did all this for only $200, and she didn’t charge us delivery or cutting fees. According to Bridal Guide, the average wedding cake cost $466 in 2014, not including delivery and cutting fees. The cutting fee can range from $1 to $8 per slice. We ordered a cake for 150 guests. (Confession: We had 190 guests. We were hoping not everyone would eat cake!) A cutting fee could have cost us between $150 and $1,200! When it comes to delivery fees, Cake Boss states that many bakeries charge at least the federal reimbursement rate for mileage. That rate was 54 cents per mile in 2016. We could have spent between $650 and $1,700 on the cake and cutting and delivery fees if we had ordered from someone else! Our generous parents were more than willing to relieve some of our stress. I called my parents back in Arkansas and said I was having trouble finding an antique typewriter to use for decoration. My dad hopped in his car and drove from antique store to antique store until he found the perfect typewriter for $85. Don’t walk all over your loved ones, but don’t be afraid to ask for help. If you really want an affordable wedding, my best advice is to keep it small. But if you’re like me and that just isn’t an option, sniff around. You might find some amazing deals. Your Turn: What weird places have you shopped at for your wedding? Laura Grace Tarpley is a freelance writer who teaches English in China. She has awesome parents and inlaws. Her husband is OK, too.